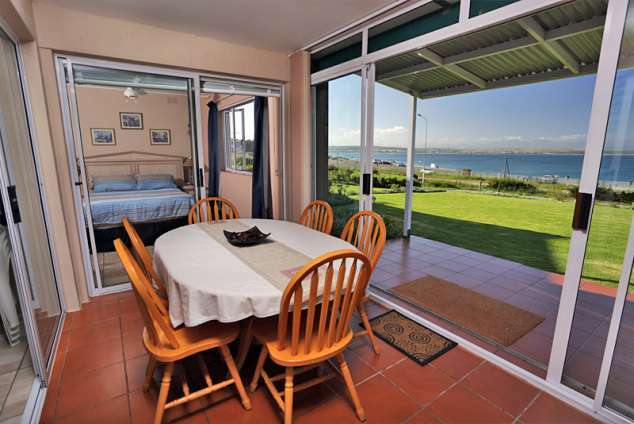 82 De Bakke Terrace - Mossel Bay Accommodation. Self-catering holiday accommodation in Mossel Bay, opposite De Bakke beach and walking distance from Santos beach. Fully furnished apartment on ground level which accommodates six people. The apartment has three bedrooms. First bedroom has a queen size bed, second bedroom has two single beds and the third bedroom has a bunk bed. The lounge has two additional sleeper couches. The apartment has two bathrooms and a guest toilet. Kitchen with stove, fridge/freezer and microwave oven and kitchen nook. Dining room with table and six chairs. The apartment is very close to town and has a spectacular view of the beach and mountain. 6042 page views since 05 Apr, 2016.